Visited Bordeaux between 24th September and 4th October 2012. The first two days were reserved for Voyage de Presse 2012 – Graves & Pessac-Leognan. As in September 2010, when I attented this Voyage de Presse event, properties chosen for me this time weren't ones I heard so much before. I really like this kind of event where you are completely down to earth and refresh/widen your wine horisont. This was very much opposite of what I normally do during primeur time, running from one high-esteemed property to another. I had great time and the organization of this Voyage de Presse was excellent. After Voyage de Presse it was time to do my own visit. However this time I chose quiet mix of properties I visited several times before and ones I wanted to visit for the first time. At the time of my stay in Bordeaux, mostly white grapes were picked. Many places they haven't even started red and sweet whites. It will be interesting to see, what Bordeaux will be capable of this time. If weather behaves itself, we can expect a vintage exceeding 2011 in terms of concentration and richness. I doubt sweet white wines will reach the quality level of last three vintages and dry white wines will probably find it difficult too. This property is situated in Cadaujac (Pessac-Léognan appelation), 18 km south of Bordeaux, and is managed by Stella Puel, who's family has been here since 1903. There are 9 ha of red vines, 50% Merlot and 25% of both Cabernet Franc and Cabernet Sauvignon, Vines are 20 years old on average. Traditional vinification with wine staying in 25% new oak for 12 months. Bardins also produces white wine from 0.4 ha (1/3 of Sauvignon, Semillon and Muscadelle) of 50 years old vines. Fermentation in barrel with batonnage de lie and stay in oak for 10 months. I tasted 2009 and 2006 red, special cuvée Les Helloties de Bardins in vintage 2003 (70% Cabernet Franc, 20% Malbec + Petit Verdot and 10% Merlot) and 2011 white. Both 2009 and 2006 were of fine quality. Robust wines, well-filled with black fruit and tannin, very good acidity and well-balanced. They will surely be better with age. Special cuvée, Les Helloties de Bardins, showed fine things coming from Cabernet Franc and Petit Verdot, such as power, concentration and strong backbone. 2011 white showed fine aroma of apple and pear, well-defined acidity, fine balance and fine fruity finish. Bardins is certanly fine value for the money. White grapes anno 2012 were already brought in at time of my visit, but Stella Puel told me that red ones had to wait one week or even longer, all depending of the weather. This property is situated in Portets, AOC Graves. There are 6 ha of red vines (80% Merlot + 20% Cabernet Sauvignon, 25 years old on average) and 4 ha of white vines (80% Semillon + 20% Sauvignon, 35 years old vines). I tasted 2010 vintage in red, Grand Abord normal cuvee and Grand Aboard Cuvee Passion. Normal cuvee was round and fruity, with good intensity and length. A bit too simple for my taste. Cuvee Passion, which is kept i 400 hl oak barrels (30% new) for 12 months displayed better structure, more concentration and better integration of fruit and tannin. Good quality but not a wine for long cellaring. Among 2009 reds my cherry picks: de Sauvage was splendid, packed with cherry fruit, fine structure, length and long fruity finish. Would merit score of 89-90. D'As, Chantegrive, Domaine de La Chouette, Crabitey, Grand Abord, du Haut Maray, Lasalle, Magence (oak matured), Magneau, Cuvee Paumarel (de Reys), Pont du Brion, Roqutaillade La Grange and Toumilon, were all well-made wine with ripe fruit, very nice, balance, very good structure, and fruity aftertaste. Scores would be 88p. Among 2010 whites I liked very much Chantegrive Cuvee Caroline, a very complex, fresh wine, with loads of fruit, finesse, splendid structure and long meaty finish. 91+p. Other wines which caught my attention were: de Cerons, Grand Abord, du Haut Maray, Lusseau, des Places, Pont de Brion, de Respide, Roquetaillade La Grange, de Sauvage and Toumilon. All deserving 88p. This property was my next stop and I did taste 2011 white plus 2008 and 2006 red. White is 0.5 ha planted with 50% Semillon and 50% Sauvignon, while red is 6.5 ha planted with 50% Merlot, 40% Cabernet Sauvignon, 5% Cabernet Franc and 5% Malbec. Both wines are aged in barrels for a period of 12-14 months. 2011 white was very enjoyable wine with nice acidity, lemon grass and acacia flower on the nose, smooth and round on the palate. 2008 red was potent and tannic wine, well-structured and with nice future, while 2006 showed same very nice qualities as 2008, but was more round and softer. Nicely made wines here. This property is owned by de Butler family. There are 26 ha of red vines (40% Cabernet Sauvignon and 60% Merlot), 28 years old on average, and 2 ha white vines (50% Semillon and 50% Sauvignon), 22 years old on average. Red wine is aged in 33% new oak for one year, while white one is treated with app. 20% new oak for 9 months. The owner kindly presented a little vertical of red Crabitey - 2001, 2002, 2005, 2006, 2007, 2009 and 2010, and a single white one - 2010. My cherry picks among reds were vintages 2009 and 2010, potent, strong, well structured, lots of ripe black cherries and blackcurrants and long finish. 2005 and 2006 were rather tough and rustic, needing time to get round and friendly, 2007 was very good for the vintage with nice intensity, fat tannin and persistent finish, while 2001 was very drinkable with nice structure and length. 2010 white showed fine fruit, acidity and long caressing finish. Interesting property to visit - very fine quality. I think there is room for more attention to details at Crabitey, because this property has potential to make even better wines, as they have really great soil. This property is owned by Rene Leriche and his wife Marie-José Leriche (sister of Anthony Perrin fra Carbonnieux) and is situated in Léognan commune, close to Domaine de Chevalier, Fieuzal and Malartic Lagraviere. There are 8.2 ha Sauvignon Blanc, 2 ha Semillon, 12.7 ha Merlot, 12 ha Cabernet Sauvignon and 1.1 ha Cabernet Franc. Red vines are 21 years old on average, while whites are 19 years old. Both red and white wine is aged in 33% new oak for 12 months. Le Sartre produces splendid wines, which was confirmed at the tasting of 2010 reds/2011 whites at Couhins (see below). This property was in the process of harvesting white grapes when I visited it. Harvested white grapes are kept overnight at 6-7˚ before pressing them. There were many goodies among reds. Smith Haut Lafitte (94p), La Louviere and Malartic Lagraviere (93p), Carbonnieux, Couhins Lurton and Le Sartre (92p), Bardins, Brown, Bouscaut, de Fieuzal, Luchey Halde (! ), Olivier, Picque Caillou and Rochemorin (91p), Le Bruilleau, La Garde and de Grand Maison (90p). No real bad wines and the remaining 17 wines were to be found in 86-88 points range. Really fine performance but 2010 vintage made things easy for proprietors. Whites were generally of really splendid quality. My cherry picks - Smith Haut Lafitte (94p), Latour Martillac (93p), Carbonieux, de Fieuzal, La Louviere and Picque Caillou (92p), Bouscaut and Couhins Lurton (91p). Brown, Cantelys, Cruzeau, Ferran, de France, Luchey Halde and Le Sartredeserved all 90p score. This property which is situated in Leognan, owes its name to Scottish wine trader, John Lewis Brown, who also owned Cantenac Brown in Cantenac, Margaux. Nowadays, Brown is owned by fifth generation of Mau family, Jean-Christophe Mau, who also is negociant. There are 28 ha vines, splitted between 23.5 ha of red vines (55% Cabernet Sauvignon, 40% Merlot and 5% Petit Verdot, 20 years old on average) and 4.5 ha white vines (70% Sauvignon + 30% Semillon, 15 years old on average). Red wine is matured in 33-40% new oak for a period of 14 months and white in 50% new oak for 8 months. Brown has excellent vinification facilities. For red wine Brown has famous consultant, Stephane Derenencourt. Despite relatively young age of vines, this property makes splendid wines, which was confirmed by tasting 2009 red and 2010 white. 2009 red had silky fruit and tannin, strong structure and fine balance, fine fruit sweetness and persistent fruity finish. 2010 white had great freshness, acidity and copious quantities of acacia flower/lemon grass aromas, fine balance and caressing fruity finish. There was an interesting conference, but imho mostly for people with vast vine cultivation knowledge, about geographical history of soil for vines in Graves/Pessac-Leognan. Afterwards we had the possibility to taste 2008 La Mission Haut Brion and 2008 Haut Brion, both in red. Both were rare treats with Haut Brion edging La Mission Haut Brion imho. 2008 La Mission was strong with copious black fruit and fat tannin, great depth and complexity, and long persistent aftertaste. 2008 Haut Brion was more polished and fruitier than its sister and had more nuances and longer finish. Excellent wines for the vintage. All the mentioned properties have their own website, so if someone needs more detailed information, Google it or/and ask Syndicat Viticole de Pessac-Leognan/Syndicat Viticole des Graves for more info. I came back to La Mission for previously arranged rendez-vous and this time it was the highly heralded 2009 vintage on the "menu". Both Grand Vins + second wines in red and both whites were tasted. Chapelle de La Mission Haut Brion, second wine of La Mission, presented itself very well with sweet and aromatic fruit, fine ripe tannin, fine structure and concentration, and finished with smooth fruity finish. 91p. Le Clarence de Haut Brion, second wine of Haut Brion had more of everything than Chapelle with firmer and longer finish. 92p. La Mission Haut Brion exhibited very complex nose of black cherries, excellent concentration on the palate, great depth and structure, sophisticated touch and long finish. Fabulous stuff. 97p. Haut Brion was even more aromatic than La Mission on the nose and deeper on the palate with stunning complexity. Very long aftertaste, fruity and firm. Stunning performance. 99p. Whites gave every reason to be impressed. La Mission Haut Brion offered stupendously complex nose of acacia flower and pear, was fabulously refined on the palate with excellent acidity and fat, caressing fruity finish. Extremely impressive wine. 96p. Haut Brion displayed more strength and power, more complexity, length and fatness, longer finish than La Mission. Exceptional stuff. 97p. The owner, Dennis Darriet told me they still waited with harvest at Seguin as grapes haven't approached the full phenolic ripeness. Tasted last three vintages - 2009, 2010 and 2011. For me, this property has emerged as one of the greatest values for the money not only in the district but also in whole Bordeaux. And it's not even a classified growth!! 2009 was very intense wine with gobs of blackberries, black cherries, stunning balance, finesse and elegance, and sophisticated touch. Beautiful classy wine and great effort indeed. 94p. 2010 was a masterclass wine with more intensity, concentration, fatter and silkier tannin, stronger structure and longer finish than 2009. 96p. 2011 offered splendid nose of ripe cherries, remarkable depth and intensity. Silky on the palate with strong structure, fine length and smooth aftertaste. Seemed to have improved further since tasting it in March 2012. Excellent effort for the vintage. 93p. On my way to Bon Pasteur, I made a short stop at La Consellante. They were harvesting young Merlot grapes and I saw this propetty's new cellar. I had appointment with Dany Rolland, but as she was obliged to go to Paris for very important meeting this particular day, I was received by Florent Benoit, Rolland's export manager for Europe. I did taste 2011-2010-2009 vintages and must admit I expected an attack of tannin and extraction in these wines. Nothing of this ladies and gentlemen, wines showed as gentle as a lambs. It was with 2008 vintage, Michel Rolland significantly changed vinification at Bon Pasteur, which covers 7 ha splitted between 52 (!) parcels. After manual sorting whole grapes were transfered to barrels, plot by plot, and maceration happening by simply turning the barrels. Maceration lasted for a period of 40-60 days with half of the period where barrels were not moved. In his opinion this was a far more precise vinfication than before. So 2009, 2010 and 2011 were made after same procedure. 2009 was very flavourful (cherries and violets), had splendid complexity, silky fruit and tannin, finesse and elegance, and smooth fruity finish. Very seductive wine. 94p. 2010 exhibited excellent purity and silkieness, aromatic black cherries, mocha, chocolate powder, cocoa, fat and perfectly ripe tannin, richness and sophisticated touch, long fruity and caressing aftertaste. Beautifully crafted wine worth every point of my 95+ rating! 2011 was not that far from 2010 and 2009, with black cherries and blueberries, very aromatic, violet scent very present, great complexity and long persistent finish. Great success for the vintage here. 93p. I'm sincere and admit that this property has became one of my favourites in Pomerol. I love to come back here every year and follow in the development of recent vintages. I spent app. 5 hours at Bourgneuf this particular day and tasted vintages 2010-2009-2008-2001-2000-1975. My visit was spiced up by visit of Gilles Pauquet, famous consultant on Right Bank (Bourgneuf sends grape juice samples to his wine-laboratory for analysis) and later by visit of well-renowned French wine critic, Michel Bettane. There was lot of talking about new classification in Saint-Emilion, who deserved elevation to higher rank, who didn't and who missed the glorious chance of going up in the hierarchy. 2010 (now in bottle) confirmed the staggering quality it showed from barrel and for me it's the best vintage ever made at Bourgneuf. What an achievement for Frederique Vayron, as she only started to take over vinification at Bourgneuf with 2008 vintage. This masterclass wine offered extremely intense nose of black cherries and grated chocolate, stunning complexity, sophisticated touch, fat ripe tannin and extremely long finish. True and refreshing Pomerol wine without modern gimmicks. Wonderful stuff. 96p. 2009 was almost identical as 2010 in terms of intensity, flavours and complexity. The only difference was tannin, which wasn't as perfectly ripe and fat as in 2010. Nevertheless, a beautifully made wine. 95p. 2008 was quite different from 2010 and 2009, meaty and chewy wine, with tannin being in front but in balance with red fruit, and persistent finish. Tight and a little old-fashioned style here. 91p. Then 2000 against 2001. 2000 was powerful and showed dusty fruit, still young, concentrated and full of black fruit. 93+p. 2001 was surprisingly more fresh, very truffy, stronger and longer on the palate than 2000. Gilles Pauquet made a point here, saying that 2001 vintage is better than 2000 in Pomerol and that Frederique Vayron succeeded extremely well in creating very precise fruit expression in vintages 2009, 2010 and 2011, compared to older vintages. Tasting finished with 1975 vintage, which tasted somewhat older than the bottle I had a week before in Copenhagen, which was delicate wine, very tasty, splendid balance, splendid structure and caressing finish with fine acidity which kept it together. 37 years old wine at its very peak and just delicious. 92p. I came back to Bourgneuf 3 days later to see harvest. With me I had Francois Mitjavile from Tertre Roteboeuf and he was invited by Veronique Vayron to taste the grapes lying on sorting table. He agreed 100% with Vayrons that they were at their optimum time to be harvested. Beautiful sunny day with blue skies! I'm on my way to Jean-Luc Thunevin offices to retaste 2011 vintage from his properties. Retasted eight 2011s and one 2009. For the 2011s the impression was almost identical compared to March 2012. Bellevue de Tayac (Margaux)had fine nose of of red + black berries, fine structure and fine complexity. Caressing and long finish. 90p. Bel-Air Ouý (St-Emilion) had fresh aroma of crushed blackcurrants and blueberries, discrete tannin, attractive fruit and fruity finish. 89p. Clos Badon Thunevin (St-Emilion) showed sweet fruit, strong and fat tannin, some oak, fine balance and firm finish. 91p. Clos de Beau-Pere (Pomerol) was meaty and fleshy with fine concentration of black cherries, fine structure, complexity and firm aftertaste. 92p. Domaine des Sabines (Lalande de Pomerol) showed intense fruit with earthy and spicy notes, strong backbone and fine firm finish. Very fine effort. 89p. 3 de Valandraud reminded a lot of Bel-Air Ouý. 88p. Virginie de Valandraud (St-Emilion) had fine fruit, elegant nose, silky tannin, fleshy palate, fine balance and smooth fruity finish. 91p. Valandraud offered extremely complex nose of black cherries with great intensity, length, depth and structure on the palate. Very rich and complex wine. 95p. 2009 Valandraud was very potent, robust with excellent fruit intensity on the nose and palate, full load of black cherries and blackberries, impressive complexity, fabulous balance and long lasting finish. Exceptional wine. 97p. Francois Mitjavile - I've known this guy for 24 years and every visit here has been a one to remember. What he does with his grapes, turning these into mind-boggling wines, is just truly fantastic story. He doesn't make second wine, his decision to discard only really bad grapes from entering vats, allowing raisiny ones to pass (he says that raisiny grapes give roasted character to wine), no state of art cellar and equipment, and yet how he manages to make such fantastic wines. Incredible winemaking skills. I had pretty much time to spend at Tertre Rotebouef this particular day, so I took my time to taste wine Francois prepared for me. 2004, 2009, 2010 and 2011 of both Tertre Roteboeuf and Roc de Cambes. 2004 TR was charming and elegant, subtle, with splendid balance and length and had very fruity and caressing finish. Lighter style in this vintage. 93p. 2004 Rdc has opened at last after several closed years and showed very aromatic style, was meaty and had fine black fruit intensity, fine length and long fruity aftertaste. 90p. 2009 TR had stunning aroma of black cherries, very sophisticated approach, velvety fruit and tannin on palate, fabulous purity, richness and balance and long, long finish. Simply awesome wine. 96p. 2009 RdC was surprisingly stronger and more powerful than TR, however with less richness and purity. Seductive, sweet black cherries and blueberrries. Excellent quality. 92p. 2010 TR made me almost cry. It's probably the best vintage ever Francois Mitjavile has produced. This wine is no less than phenomenal now after bottling. It's fourth time I tasted it and ageing in oak kicked this wine higher up in quality. What an intensity, opulence, richness, length, depth, velvety fruit and tannin, silkiness all over. Wow!! 99p and I'm maybe a tad conservative. 2010 RdC was incredible stuff with obvious character of TR, but less rich and intens. Also the best Rdc I've ever experienced here. 94p. 2011 TR tasted less expressive and lighter than in March 2012 and I thought then it was close to 2010 TR. But 2010 TR seemed to run away from its one year older brother. Still immense quality. 95p. The same happened to 2011 RdC, but also here the quality is extremely impressive. 92p. 2011 Domaine de Cambes (part of RdC vineyard situated very close to the river) was an easygoing, soft, round and charming wine. 87p. On my way to Libourne in Francois Mitjavile's car, we stopped at Lafleur. They was expecting to harvest the day after and Baptiste told me that they had great expectations for 2012 vintage. 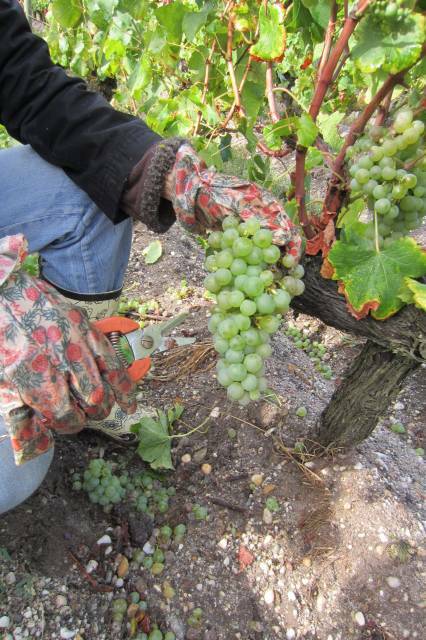 Botrytis hadn't fully covered grapes in the vineyard, so harvest wasn't started. I tasted vintages 2004-5-6-7-8-9-10-11. 2004 had spicy and intense fruit like pineapple and apricot, fine fruit sweetness and corresponding acidity, finesse, fine balance and honeyed finish. Splendid wine. 92p. 2010 was just bottled and therefore quite disturbed and difficult to assess. I'm sure it'll great when I taste it next time. NR. 2011 had petrol on the nose, big range of botrytised flavours like grapefruit, lemon peel, pineapple and pear. Distinguished, rich and long on the palate with great sweetness, acidity and graceful aftertaste. Silky texture. Extremely impressive wine. 95+p. This was last day of visiting properties and my friend from Bordeaux and me left busy town of Bordeaux to go to La Tour Carnet, on of many properties owned by Bernard Magrez. It's beautifully situated estate, with tower originating from 11th century, so you really feel the clock had been turned back 10 centuries. Buildngs have been impeccably restored. The whole property covers 126 hectares, including little lake around chateau and woods/park. 73 ha are planted with vines - red - 50% Merlot, 45% Cabernet Sauvignon, 3% Cabernet Franc and 2% Petit Verdot - white - 60% Sauvignon, 30% Semillon and 10% Muscadelle. Vines are 30 years old on average. White wine is made in very small quantities. We tasted 2010 white which was quite pleasant and round, quite fruity and with nice acidity. Good quality but not a remarkable one for the vintage. 87p. Reds were another story. I really fancy La Tour Carnet during primeur when I taste it blind during UGC tasting of new vintage. And the splendid quality of La Tour Carnet was confirmed while tasting 2006, 2008 and 2009 vintages. 2006 was aromatic with very really good tannin, intensity and balance, fine structure and strong backbone. Persistent aftertaste. 90p. 2008 showed more ripeness and was richer than 2006, splendid structure and better mid-palate, meaty long finish. Splendid effort. 91p. 2009 exhibited more power, strength and concentration than 2008. Riper fruit with more sweetness and better complexity. 92p. From La Tour Carnet we went to Leoville Poyferre, one of the top performers in Bordeaux. It was quite funny experience to find out where cellars and offices of Leoville Poyferre are, as they share same drive-ins with Leoville Las Cases. We were received by Anne Cuvelier and her cousin Didier. After visiting very impressive and impeccably clean cellars and modern offices, we went to tasting room to taste 2011, 2010, 2009 and 2008. I tasted these four vintages in different order (20011, 2008, 2009 and 2010). 2011 offered aromatic fruit (black cherries), was quite intense and powerful on the palate, with fine structure, balance and finish. 32 hl/ha. 94p. 2008 was almost of same style as 2011, more developed of course, with strong backbone and long finish. Only 28 hl/ha. 93p. 2009 had more power and stuffing than 2011 and 2008, much better ripeness of fruit and far more complexity. I remember this wine being not that impressive imho from barrel, but it changed dramatically to the better while aged in oak. There's strength, there's big depth and long finish. 42 hl/ha. 95p. 2010 outshined in my opinion 2009, strong and potent wine with gobs of perfectly ripe black cherries and fat ripe tannin, silky texture, excellent balance and very impressive long finish. Stunning effort. 40 hl/ha. 97p. At the time of my visit harvest wasn't started yet. This was the last stop of the day and we were treated with a little vertical - 2011-10-9-8-7-6-5. Henri Lurton is pulling strings here and it seems this property has been very stable since 2005 vintage, making high quality wines. I remember however stunning 2000 vintage tasted in May this year and excellent 1959 tasted in 2004. 2007 - round, fruity and charming wine with very nice structure, fine balance and gentle tannin at the finish. Very good for the vintage. 88p. 2006 - of course more intensity and length here, more concentration, fatter tannin, strong backbone and persistent finish, lot of blackcurrants here. Splendid effort. 92p. 2008 - similar in style to 2006, slightly richer and longer. Well-balanced. 92p. 2011 - has an edge over 2008 as fruit and tannin here are riper, structure is stronger, complexity is bigger and finish is longer. Excellent effort for the vintage. 93p. 2005 - impressed a lot with aromatic black cherries and blueberries on the nose and fat ripe tannin on the palate. Splendidly constructed, excellent structure and balance, long lush aftertaste. Great stuff. 94p. 2009 - very similar to 2005 with more apparent sweetness of fruit. Same great stuff. 94p. 2010 - black cherries, chocolate, excellent concentration, strong backbone, very tannic on the finish. Very tight wine of excellent quality. Needs time to soften. 95p. I did also taste 2011 Carmenere - strong spicy, very concentrated and tannic wine. Maybe Carmenere will be a part of assemblage at Brane Cantenac in coming vintages. I finished this article on the 28th October and harvest for all Bordeaux except Sauternes & Barsac is over. Right Bank could be quite successful in 2012, especially Pomerol, if properties finished harvest before 10th October. I'm not so sure about Left Bank as properties there received lot of rain during weekend of 19-21st October and some rain week before that. We'll see what Bordeaux winemakers can produce in this difficult vintage, where weather wasn't that kind to them.